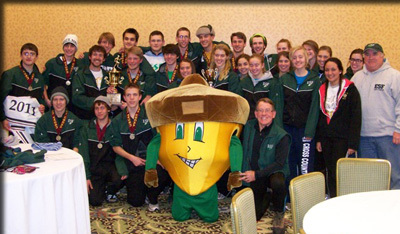 The ESF Mighty Oaks men's cross-country team won the United States Collegiate Athletic Association's national championship in Lake Placid Friday, Nov. 11. The Mighty Oaks women finished second in their competition. Four ESF runners - two men and two women - were awarded All-American honors. The men's team was led by freshman Brian Busby, who was barely edged at the finish line by Abram Deng of Spaulding University in Louisville, Ky. Deng got the victory, finishing less than a tenth of second before Busby. Busby's time in the 8K race was 27:18.03. Busby had earned Runner of the Week honors from the USCAA Oct. 11 after setting a course record in the Cazenovia College Invitational. His teammate, freshman Timmy Callahan, finished fourth with a time of 28:34.04 despite losing a shoe at the beginning of the race. "Timmy ran the entire race with one shoe," Mighty Oaks Coach John View said. "And it snowed up here last night so there was snow on the course." Busby and Callahan received All-American honors. The men's race featured 209 men from 26 teams. Also competing for ESF were freshman Ethan Washburn, 13th; freshman Andrew Gritzmacher, 14th; sophomore Matt Deluca, 17th; freshman Jacob Wolfgong, 20th; and junior Collin Bartholomew, 26th. Freshman Cambria Ziemer led the Mighty Oaks women, finishing third among 157 runners from 26 teams. Ziemer's time for the 6K race was 25:30.64, about 14 seconds behind the winner and 23 seconds in front of ESF teammate Danielle Kaveney, a junior, who finished fourth. View said the women's goal was to beat the defending champion, St. Mary's College of the Woods in Indiana, which finished third. Zeimer and Kaveney were named as All-Americans. The first-place finisher among the women's teams was Southern Virginia University. The other women competing for ESF were junior Erica Grohol, 11th; sophomore Danielle Zgardzinski, 14th; junior Emily Martin, 19th; freshman Elizabeth Bourguet, 33rd; and junior Kristin Pasquino, 41st. "I'm still numb," View said. "I thought we stood a good chance but these guys all stepped up and they all ran the race of their lives. And the women ran a great race and finished second. They beat the defending champion."